The lab setup included Fluke's DSX-5000 cable analysers and a 50m length of Cat 6 U/UTP that was subjected to thermal degradation inside a specially constructed heat chamber. 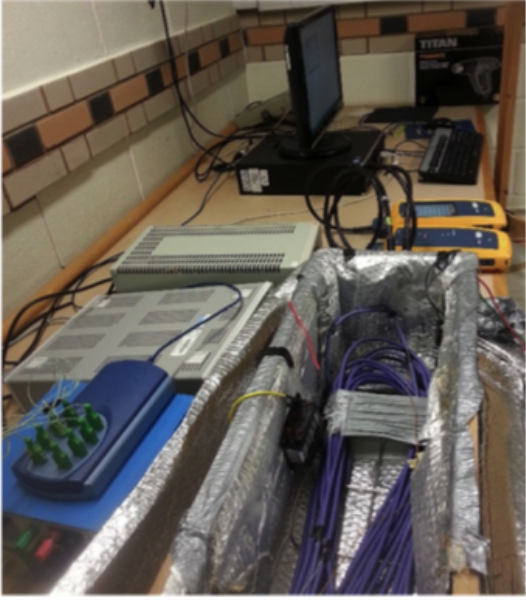 During testing conducted by Excel and De Montfort University in 2014, it was observed that heating due to remote powering over twisted pair cables appeared to degrade performance. With power heading towards 100W, this could be significant. In fact, we even witnessed failure within the cable bundles when thermally insulated and operating at this high power and hence temperature. For this present study, we assessed the performance degradation of balanced twisted pair cable by repeated heating cycles for both temperatures within the standards specification and beyond. It was suspected that repeated heat cycles would lead to accelerated ageing of the compounds used for the dielectric insulating materials around the conductors, which in turn would lead to changes in the performance values of the cables when tested.